Did you know that one in three kids are overweight or obese? Obesity is an epidemic that is now affecting children as young as 3 years old. 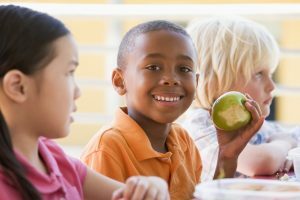 September is National Childhood Obesity Awareness Month, and it’s never too early to start to teach your kids about how to live a healthy lifestyle. If they learn these things from a young age they will be less likely to become overweight and, therefore, lower their risk of developing type II diabetes, sleep apnea or bone and joint disorders. Today, we’re sharing 6 health habits to teach your children. 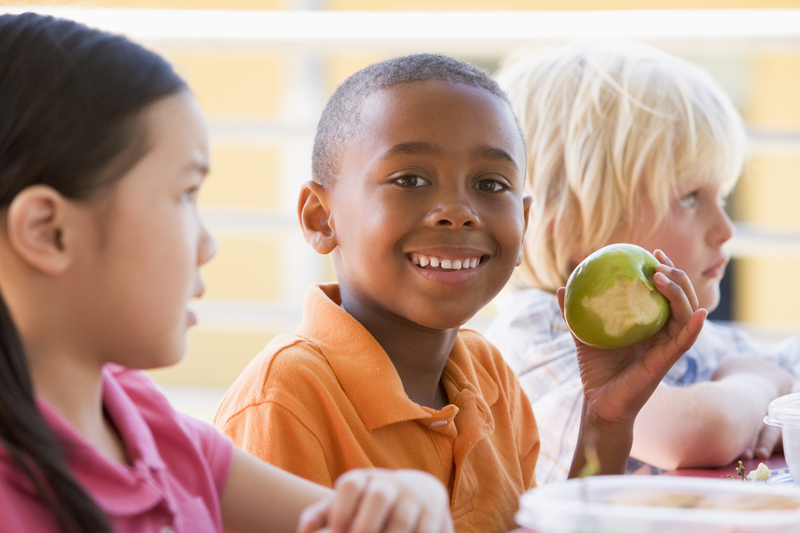 Kids need to eat breakfast in order to keep them full and focused while at school. Aim for something high in protein to hold them over. Studies have also shown that children who eat breakfast have a lesser occurrence of obesity than those who don’t. Plus it prevents bingeing when it comes to lunch or after school snacks. An easy way to teach kids about eating a wide variety of healthy foods is to tell them to eat the rainbow. Having a plate that’s full of many different fruits and vegetables in vibrant colors provides a lot of different vitamins and minerals. A big mistake some parents make with kids is forcing them to play sports. I understand the idea behind it, but this philosophy may backfire. Let them try a sport; if they don’t like it, don’t force it. They need to learn that exercise is fun, not a punishment. If your child isn’t athletic encourage them to stay active in other ways. Activities such as playing tag or jumping rope are great ways to get the heart pumping. Kids are never too young to know what’s in their food. Teach them about ingredients they should avoid eating such as high fructose corn syrup. If you give them the tools they need to eat healthy, they will make good food choices when you’re not around to help them. Stress the importance of sleep. Make sure they know that electronics or TV are not allowed right before bed. One of the most important healthy habits to teach your children is the idea of self-love. Kids can be so hard on themselves and have no sense of self-worth. Teaching them to have love and respect for themselves is a huge key to success. 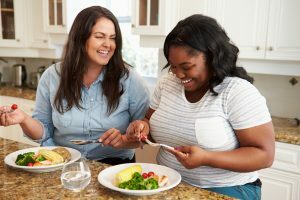 To learn more about nutrition for children, as well as how to get them set up for a healthy school year, pick up the Women’s Mind Body Wellness Summit. Dr. Jennifer Shell discusses how dangerous sugar is for kids and Alyssa Sullivan discusses nutrition programs in daycare. 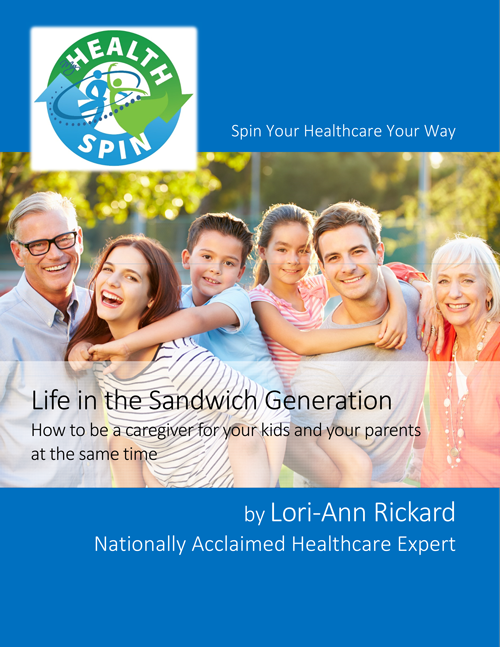 This summit also includes four other interviews from top female health professionals as well as two bonus workout videos, plus three inspirational videos from myself, MyHealthSpin Founder Lori-Ann Rickard. Polycystic ovarian syndrome, more commonly known as PCOS, affects almost 5 million women in the United States alone. And sadly, many of these women are left undiagnosed. Today, we’re going to discuss the signs of PCOS and dietary changes you can make to lessen your symptoms. Typically, women with PCOS are overweight or even obese. And often times they hold their weight around the waistline. It’s not abnormal for women to have body hair. What is more important is to pay attention to the location, as well as the color and thickness of it. Women with PCOS tend to have thick, coarse body hair on their face (typically the upper lip and jaw line), chest and back. Due to the increased hormone levels, women with PCOS often times have oily and acne prone skin. PCOS is a result of increased hormones, typically the predominantly male hormone testosterone. One of the early signs of PCOS is missed or irregular periods. PCOS can also cause ovarian cysts and infertility if left untreated. In order to help improve your PCOS it’s important to get to the root of the cause. Changing your diet can be a huge factor. Foods that cause inflammation, namely wheat and dairy, can wreck havoc on anyone’s body, let alone those with PCOS. Try including anti-inflammatory foods, such as turmeric, blueberries, ginger and beets. Iodine is a naturally occuring trace mineral in the human body. It is essential for creating thyroid hormones. Iodine can also help prevent or reduce ovarian cysts, which are common with PCOS. To be sure you’re getting enough iodine you can try adding seaweeds to your diet. If that’s not up your alley, try eating some navy beans or taking a liquid iodine supplement. Women with PCOS are predisposed to developing diabetes. Therefore, it is important to keep your blood sugar levels in check. Most boxed or processed foods are high in sugar. Try sticking to healthy, home cooked meals instead of those found in a box. To learn more about how dangerous refined sugar is and how supplementation can help improve your diet and nutrition pick up the Women’s Mind Body Wellness Summit. Chiropractor Jennifer Shell discusses all you need to know about nutrition. The WMBW Summit contains 6 interviews from top female health professionals plus three bonus videos from MyHealthSpin Founder Lori-Ann Rickard, as well as two bonus workout videos. Use promo code “BEWELL” to recieve 50% off! Did you know that over 6 million people suffer from atrial fibrillation in the United States alone? Atrial fibrillation, or A-fib, is an irregular, sometimes rapid, heart beat. Due to this A-fib can cause poor blood flow, lack of energy, fatigue, shortness of breath and heart palpation. Today, we’re going to discuss things you can do to strengthen your heart and improve A-fib. Oily foods, such as fish, walnuts and avocados are full of heart healthy omega 3s. Also, blueberries and raspberries are high in antioxidants, which are heart smart. If you’re using regular table salt you want to be sure to avoid it in high quantities. Too much salt can cause high cholesterol and impact A-fib. If you like salt, try switching to pink Himalayan salt. It’s delicious and is full of trace minerals. You don’t need to run to get the cardiovascular benefits of exercise. Brisk walking and weight lifting (even if the weights are light) can still get your heart pumping and help to strengthen it. 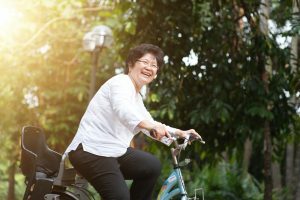 Aim for at least 30 minutes of activity at least five days a week. Unfortunately that morning cup of joe could be worsening your atrial fibrillation. Caffeine increases your heart rate which can trigger A-fib. To learn more about the benefits of reducing sugar intake and how supplements can help improve your diet and nutrition, pick up the Women’s Mind Body Wellness Summit. 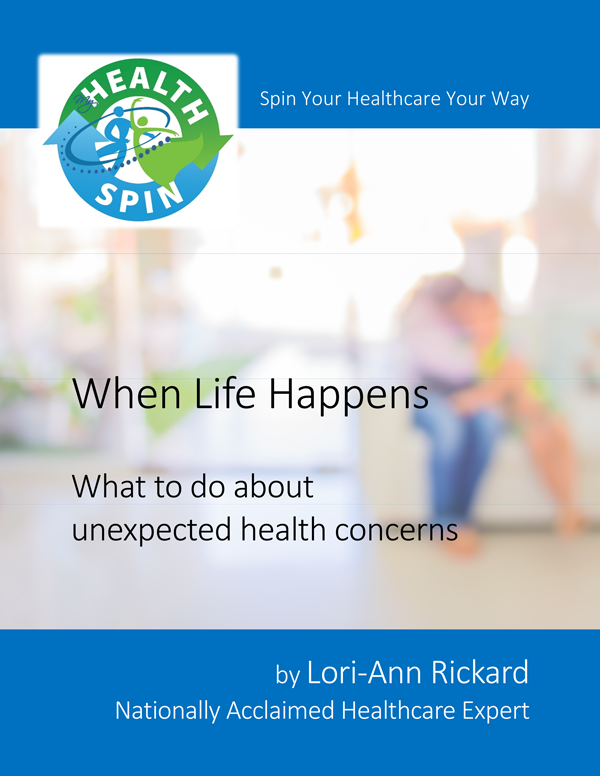 Cardiologist Joan Crawford discusses everything you need to know about heart health.The Summit contains 6 interviews from top female health professionals plus three bonus videos from MyHealthSpin Founder Lori-Ann Rickard, as well as two bonus workout videos. Use promo code “BEWELL” to recieve 50% off!